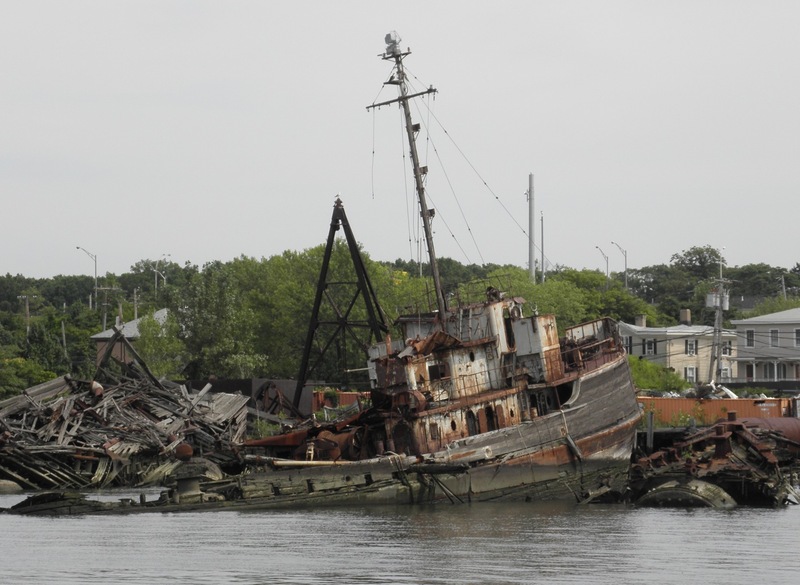 In the numismatic world, “pristine” means “never cleaned.” This captures something about the beauty of the “inner coast” aka “the Kills.” As industry moved there, particularly, petroleum, which–like it or not–is the life blood of our world culture, the Kills have served as a laboratory in which human environmental modification and nature’s reaction have struggled in a dance of action v. reaction. Click on the fotos to enlarge them. I admit I can’t identify a lot of this debris, so please help me out and I’ll revise this post as we go. 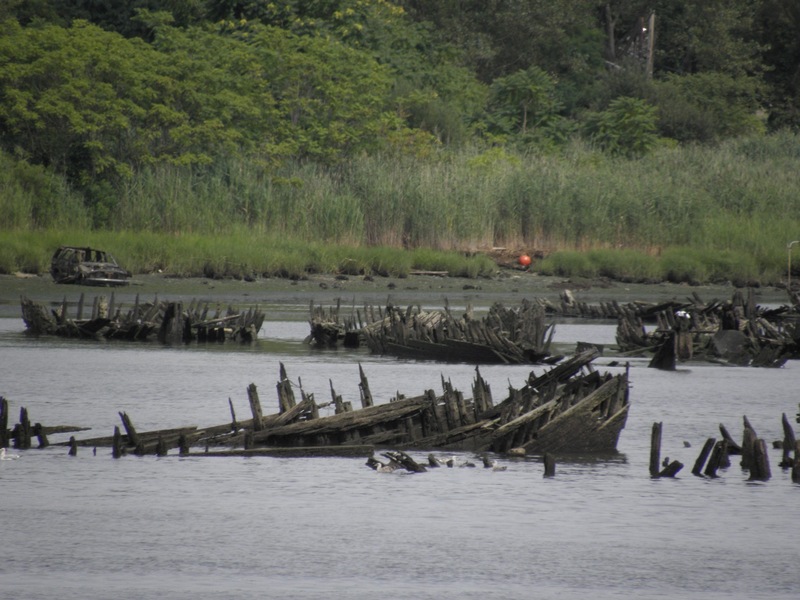 Between Shooter’s Island and Mariner’s Harbor lie these remnants of . . . paddlewheels and ship’s boiler. Osprey have recognized the strategic value of the boiler as a nesting platform and moved in. Anyone know the paddlewheel story? Here’s a view of the second paddlewheel. 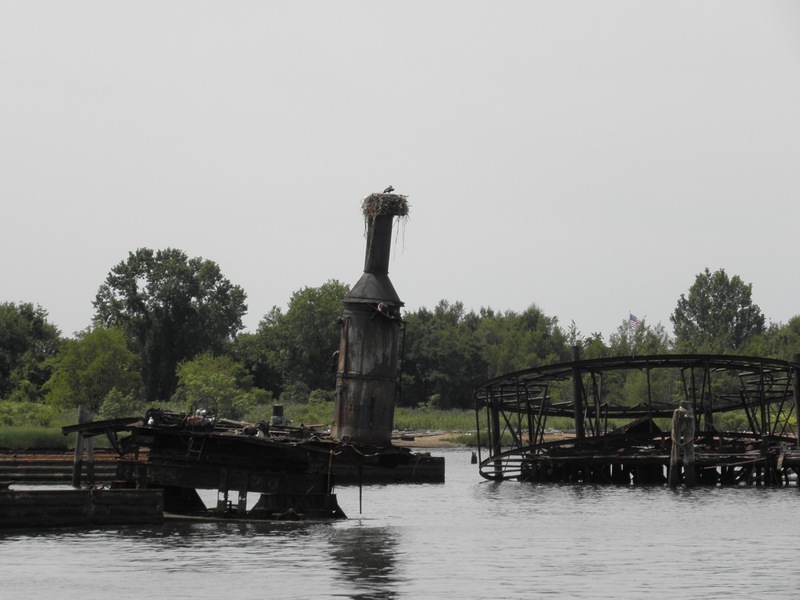 Farther down by Rossville rests retired Army tug Bloxom (1944), which I wrote about last year. Amazing to me is that tugs of this same era–and older–still work. A little farther south are two unidentified wooden tugs. Anyone know them? In the same Witte yard, here’s another wood-hulled tug. 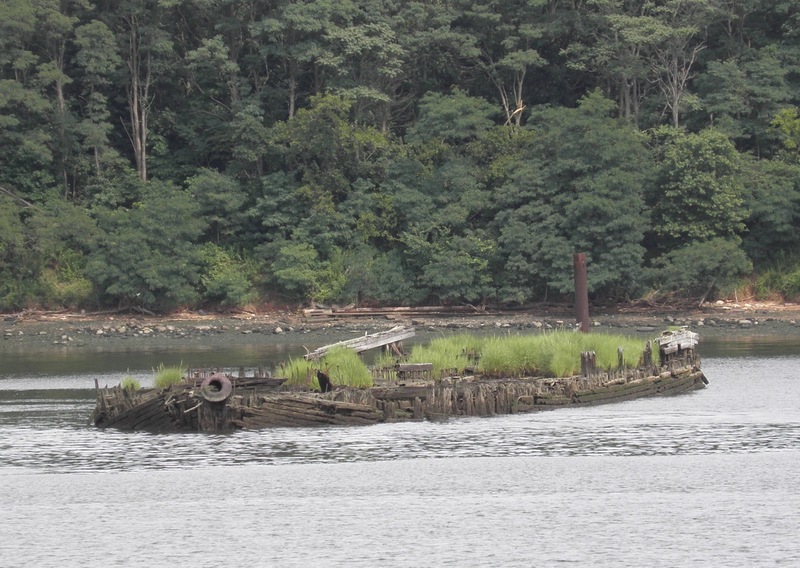 This interesting steel hull–on the bank off Charleston (Staten Island)–seems to have been a smaller ferry. Anyone? 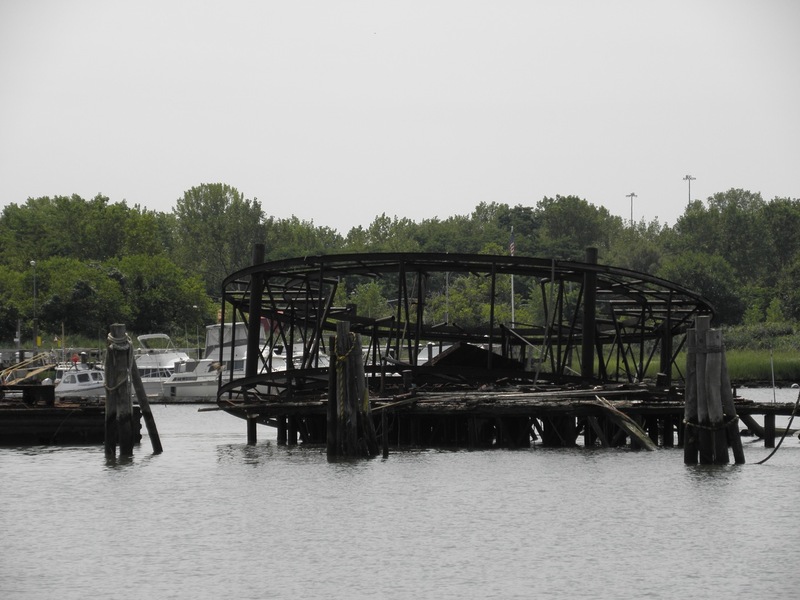 In the same collection of decrepit wrecks, notice the nest (osprey?) on the stem bitt of the vessel to the left. More interplay of decaying machinery and nature, here with a car joining in. Also off Charleston, and in this case, a meadow forms on the erstwhile deck. I hope to get back here soon. More Circum Staten Island fotos next time. For now check out fotos of Shaun O’Boyle, opacity, and –of course–the intrepid Miru Kim. All fotos here by Will Van Dorp. I’m absolutely fascinated by these boats. Certainly not paddlewheels. That was formerly the yard of the dock builders Spearin, Preston & Burrows. I believe they were forms for setting rings of sheet piling, to create large mooring dolphins for tankers. The vertical boiler is from one of their derricks or piledrivers. The large wooden hull tug with steel deckhouse was World War II construction. 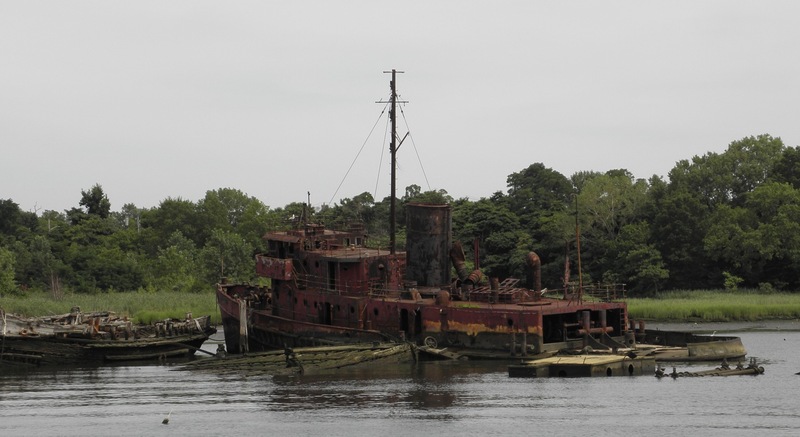 The Meseck Towing Co. bought three after the War for coastal towing. They all ended up in Witte’s. 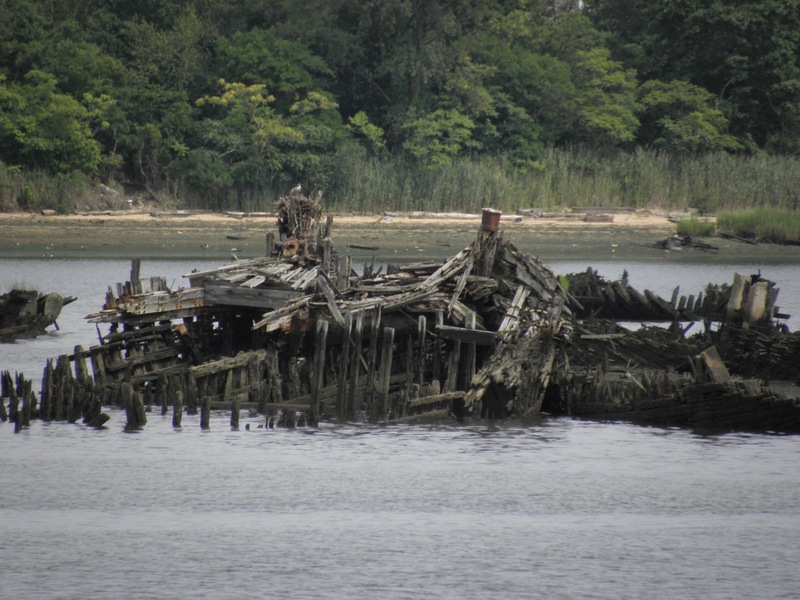 The steel hull off Charleston is the ferry ASTORIA, a sister of the MAJ. GEN. WM. H. HART. 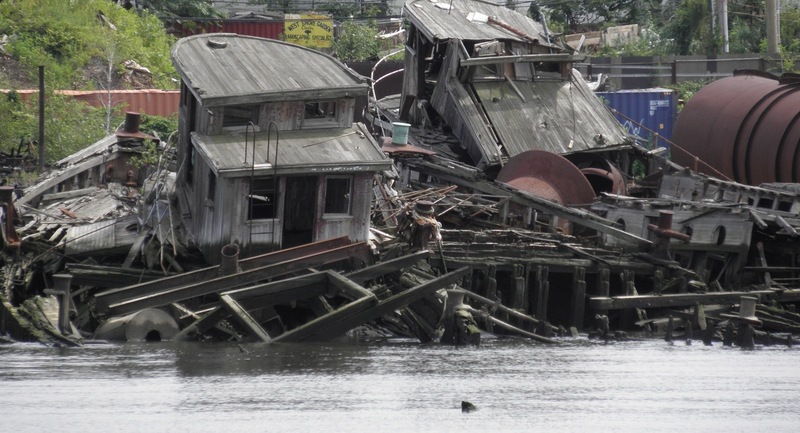 The decrepit wrecks are fleets of wooden tugs retired after the War. The last one was a wooden steamship built for World War I. Not needed when the War ended she was completed as a coastwise coal barge. big wooden tug is indeed a WW2 built ATR….this one ATR-89. Became HILA out of Jacksonville in 1949 and passed into Liberian registry by 1954.
broke down in late 50’s on a voyage from Miami and eventually ended up at Wittes. All the smaller tugs around her have been cleared away. 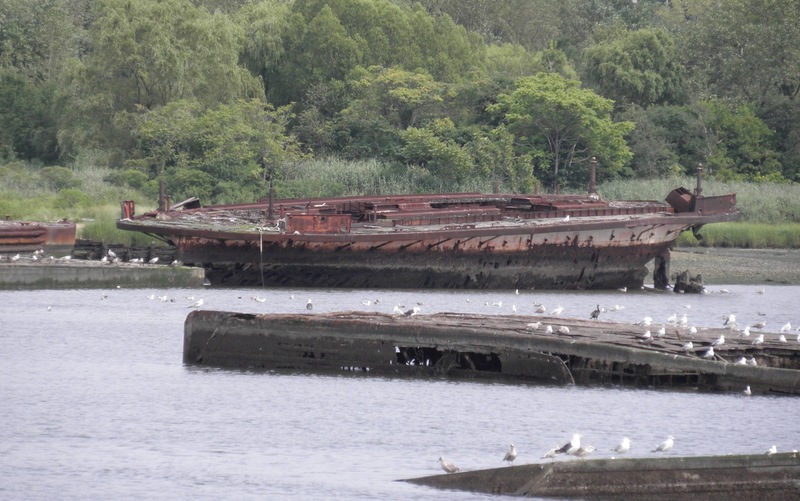 there are two sisters…ex Meseck boats….that exist as waterline hulks down at the south end of the yard. whoa. It’s Norman Brouwer, folks. Yes the one who commented on the paddle wheels is correct they were used to form the foundation to what we know now as Battery Park city . the cells were formed and the excavated dirt from the area for the trade center was filled along the west side of manhatten and later capped with sand from out off of west bank light . I like this site and would love to help in any way. i was raised all along the waterfront in these areas as was my father and grandfather too !! The ferry Astoria is almost gone. An excavator is tearing up this week. thanks so much for sending these along, esp the fotos of the Manhattan piers from a half century ago. I’m rather late to the party on this discussion, but just stumbled on your blog today for the first time. I have been researching for my own blog and due to spending entirely unreasonable amounts of time in archives, I believe you may have there a photo of the MINERVA, ex JANE MOSELEY, a side-wheel passenger excursion ship with a walking beam steam engine, launched in 1873. The document I have (Historic American Engineering Record, Mid-Atlantic Region,National Park Service) states the MINERVA is important as the earliest example of a walking beam engine vessel still existing (at the time the document was written). It says that a photo of Shooter’s Island from the 1930’s shows the MINERVA was already there at that time. This doc is unfortunately undated but is typewritten–i am guessing 1980’s–it appears to be a cultural resource survey of the ship graveyard– complete with map and vessel numbering. forgot to add this link – pictures at the Library of Congress!